June will mark one year from when we made the decision to send our Honey away for a 3 week board and train with Kristen. And can I say, what a life changer. Kristen was brought to my attention through a friend of a friend who had previously done a board and train with her. I liked what I heard so I immediately looked her up, went over reviews, pictures, videos... I was sold. I instantly felt that this would be a safe place for my honey bunny. So I contacted her and started the process. Honey is my now 5 year old pit bull. I always thought my girl was perfect the way she was, she always showed major excitement towards people. No harm right? Quite the puller on the leash but “I could handle it” as I’m breaking my neck holding her back from passing vehicles… She has had a couple altercations with dogs over toys, but nothing “serious”, her recall was good enough for me at the time but it was mostly on her terms. In hindsight, not very safe with a prey driven dog. Rushing and barking at the door whenever somebody would knock was a big issue, and not being able to pull her away from licking and jumping on the guests. To me these were all little things, but because of these experiences combined I felt like I had no control over my dog so I stopped taking her places. And I would put her in the room when people were coming by. This started my thought process to seek out professional help. It took months to come across Kristen. I won’t lie, e-collar at first scared me. I didn’t like it. And it took a lot of education before I did become comfortable with it. After reading and familiarizing myself and my spouse with the homework given, I was opening my mind to a new way of having a relationship with my dog that made so much sense. There’s a period of time when the dog gets home where you must follow a strict set of rules. FOLLOWING THROUGH and holding her accountable at a high standard in spite of the learning curve played a huge part in our bullet proof results. Honey was a soldier when she got back for 90 days. The rules were enforced always. She quickly learned that this was how it is going to be from then on, and we all adjusted. It was not easy or perfect applying the new techniques and behaviours but I tell you, was it ever necessary. I have never felt more like a leader than after this experience. Honey is now able to be calm and happy. She does whatever we ask of her and post haste, not out of fear but because she wants to. She has enough self control and confidence to tackle anything that comes our way. The techniques I have learned will always be practiced and applied because there has been a profound shift in not only her mindset but my own. I always recommend Kristen she changed our live forever and for better. This has easily been one of the best life choices I’ve made to date, it has brought me so much peace. After nineteen years, of my partner saying “No!” we adopted our yellow lab Wilson Nash. It was my first dog ever and I was beyond excited. I think I watched every dog video and training session that I could find on the internet. I realized I really didn’t know anything about dogs and in order to keep ahead of this little lab I was going to have to start training right away. I wanted to train him so he wouldn’t develop behaviours that I had seen in other dogs that were inappropriate. Initially, Wilson did well on potty training, and basic skills like sit but I started to see behaviours I wasn’t crazy over like pulling on a leash, not coming when called and chewing on everything. So as a family we started to realize that we might be out of our league. We started a group puppy class but didn’t feel like Wilson was getting enough out of it. Then we heard about “Find Your Balance” from someone that took both her dogs to be trained. We enrolled Wilson in the Puppy Training Sessions. Our family decided to go to all four of the training sessions. From the moment we entered Kristen’s house, we realized that we had made the right decision. Kristen explained our roles in condoning “naughty” behaviour and how to “reward” the behaviour we wanted to reinforce. Wilson learned fast that he could get away with certain behaviours with each different person in our family. Kristen worked with all of us to build our confidence and our leadership with Wilson. She is so professional and compassionate that she was able to correct our behaviours and give us personal guidance when working with Wilson. We were very pleased with what we learned from puppy classes but we realized we needed some more education on socializing Wilson as he thought all dogs and people should love him. Wilson thought any person who walked by had come to visit him and he thought he should visit them. He started pulling to get to them. First, we thought this behaviour was cute so we positively reinforced it by accident. So we asked Kristen if we could have a separate program created to help us learn about dog socialization and how to read Wilson’s and other dogs’ body language. Kristen to the rescue for the second time. Again, our family attended most of the sessions together. Wilson was able to learn so much from Kristen’s work and her amazing dogs. As Wilson got bigger, we had a situation that he was playing with another dog. Long story short, both dogs were into their playing and they almost ran out in front of a car. After my panic I realized that Wilson’s recall was not as good as it needed to be. This is when Kristen introduced us to remote collar training. I needed to know when Wilson was called he would come. He goes almost everywhere with us so I needed some sort of safety net. After a brief conversation we decided as a family that we needed to do the Two week Structure Board and Train. As hard as it was not to have him for two weeks, it was the best thing ever. His recall is so good now with just voice commands and the remote collar acts as a safety net. I can walk him off leash when we are hiking and I literally can take him everywhere. My girls have gained confidence with walking him and taking him to other places. Kristen continues to provide us with guidance and advice about training Wilson. Her media clips and videos are so educational and who doesn’t love to see their pet happily doing something at puppy daycare. I don’t hesitate in recommending “ Find Your Balance”. Kristen is amazing at what she does. Making life happier for all members of the family!!!! My dog Bailey is a 3 year old Husky/Terrier mix who started a 4 week board and train program after a lengthy discussion with Kristen. I poured my heart out to her about all of the issues we were having with Bailey, which included afraid of loud noises, dog and people reactive, insecure, hard to walk and the list went on. At the end of the conversation, Kristen said she could help. Kristen explained that it was going to be a lot hard work on our part but that she could help us have a better life with Bailey. Bailey completed her 4 week Board and Train and although we missed her terribly, we were excited every day to see how much she was learning. Kristen's videos were so helpful and we learned so much by watching them. She has a way of explaining things that our family of four all understood. When she was done her training, the go home sessions were amazing and instead of feeling nervous and afraid, I felt confident that I could continue her training. The benefit of the board and train program was that Bailey learned everything from Kristen first and then just transferred the knowledge to us. I love the group class environment and how I can continue learning and practicing in a safe environment with other dog owners who know exactly what we are going through. When asked by people who know us if it was worth it, I always say YES! This has changed our lives and that Bailey is living her best life. We now get compliments when walking by other dog owners where before they avoided us on the roads. We are looking forward to the many adventures we can now have with Bailey and are happy to be able to include her in our outings. We needed help with our busy rescue dog, Cooper. In his three years with us he had become more bossy and misbehaved than when he had first arrived. He was reactive to people and dogs passing by the house and nearly impossible to walk due to his leash pulling. He would jump on guests and steal things from the counter. The rescue recommended Kristen at Find Your Balance Dog Training. Within a few minutes of my first conversation with Kristen, I knew I had found the right person to address both our naughty dog’s needs and my needs as a “want-to-be” responsible dog owner. Our life with Cooper has been positively impacted by his board and train time with Kristen. He is an absolute dream to walk now. Friends are able to visit without worry of being knocked over. His bad habits were all addressed! More importantly to our long term success, Kristen provided me with the information I needed to best support Cooper in his returning home a changed boy. George is a goofy fella and super friendly but he pulls like a freight train and worries himself silly. My parents’ dog, George, a real big boy of a springer spaniel, has always had a great personality and a nose that can smell all day. He was well known for being a leash puller, and had pulled my parents over more than once trying to get that one last sniff. I had tried different harnesses and methods with him and my parents, but nothing would stick. George loved to sit on the couch or outside on his own terms and he did not take too kindly to humans trying to remove him. He would also demand to be fed table scraps, anything you were eating and he would pester you until he got his way. He was demanding about being pet and you could not stop until he said so or else he would claw, stare, pant and mouth you. He also would not load into a vehicle and would shake and be in a panic the entire time he was in a vehicle. A real “throw my weight around” dude. Everything came to a head when my father’s health issues required surgery, a hospital stay and an extensive recovery. My mother could not care for my father and a dog that did not listen. George pulled mom in front of a car one day and she was not strong enough to stop it. I couldn’t take George in because he was untrained and that would cause problems with my dog, who was trained my Kristen (Birdie) and I don’t live close enough to help out daily. I didn’t know what I was going to do. This dog was a safety issue for my parents. I was so worried about it all but after a frank conversation with my parents, I contacted Kristen. Knowing just how desperate I was, and that this dog may need to come live at my house depending on surgery outcome, Kristen immediately put me at ease. She was able and willing to put George into her busy schedule within a short period of time, helping to take the pressure off of my family. George went to Kristen for a three week board and train program and she put him to work immediately. Kristen’s well rounded program addresses all of George’s issues through obedience and mindset work. George stopped pulling on that leash and learned how to ease his worry about situations that caused him a lot of anxiety in the past. With Kristen’s training, he learned boundaries and how to accept leadership from the human instead of pulling in the other direction. After teaching George his commands and addressing his anxious mind, George is a pleasure for my parents to handle. George stayed at my house for a while after training. I was nervous about bringing him to my house, around my dog that has fought with George in the past, but his training made the transition smooth. Kristen came out to the house to check in on us and help us work through any issues that had sprung up. My parents were anxious to get George back home and with Kristen’s guidance, we set a reasonable pace with reasonable expectations while dad become more mobile. George and dad are now getting more exercise and spending time together while George heels on walks and relaxes on his bed. The old habits of whining for attention, barking at the road, roaming around and demanding food are now over because of George’s training. The sense of confidence in my parents is great to see and now George is invited to go anywhere with them because he is well behaved and can communicate with his handler to calm his anxious mind. I have even taken him to a nursing home and he was a model citizen and a pleasure for the folks to interact with. Kristen is highly recommended by myself and my family. Many friends and family have also been watching her social media and applying her techniques and common sense approach to their lives and seeing changes in their relationship with their furry friends. Her ability to break it down and teach the techniques, the ability to put it in terms you understand and relate to is top notch. We couldn’t ask for a better trainer and friend to dogs and owners. We all went from struggling to a lifesaving change to the relationship with our pet that we couldn’t have done without Kristen. We couldn’t be happier or more proud telling people how we got such “well behaved dogs”! Our french bulldog mix, Birdie, had started to become a nightmare and no matter what we tried, we were struggling. Birdie’s reactive behavior towards dogs had been escalating to food, furniture, toys - you name it. If she could land a bite, she would. If she was comfortable on the couch, or eating, she would snarl if you tried to remove her. She would seem to play nice with other dogs, and then escalate to fighting what seemed like for no reason. If she didn’t want to listen, she didn’t - she was too fast for me to catch which is beyond frustrating. Birdie would rush the fence, barking and snarling, when other dogs would walk by the house, and I was terrified of what would happen if she got outside of the fence. We didn’t feel comfortable taking Birdie out in public in case we encountered another dog, and I constantly worried she would bite someone, making her no fun to be around when people were over, because I was always on duty trying to keep her under control. Birdie felt she could do whatever she wanted, including jumping and walking all over people and other dogs, and nothing we tried convinced her otherwise. My husband knew someone that had put their dogs through Kristen’s training program, with great success. We started watching her videos and educating ourselves on the methods used. Then we went on a camping trip with Birdie. My level of fear and anxiety about Birdie biting or encountering an off leash dog was paralyzing and we left the trip early for the safety of the other people and children on the trip. That was my breaking point and I immediately contacted Kristen, I had to do something or give this dog away, I was getting desperate. I was incredibly embarrassed to say all of the things that have been going on to a stranger, but Kristen was a great listener, and immediately connected with me and what we were going through. Her vast knowledge and kind attitude was very calming for me, and I felt like I could talk to her all day about my dog worries. We signed Birdie up for a four week board and train with Find Your Balance and haven’t looked back since. Kristen trained not just the dog, but educated us on how to handle the dog, building our confidence that we can succeed. Through daily social media updates, further personalized updates, check ins, homework and a very reasonable and well thought out take home plan, Kristen gives you the full package for you and your pet to go from out of control to a confident team with rules and boundaries. There are one on one sessions with Kristen and your dog at the end of the training period, where you put your homework to the test and Kristen supports you through it while you practice handling your dog. When we went to pick up Birdie, it was incredible to see how responsive Birdie was to our leadership. Kristen fully trains your dog and then passes that training onto you. Birdie can now go anywhere that we want her to, because our collar allows us to communicate the boundaries and expectations to her in a way we have never had before. We are able to have an obedient dog, which is great, but the biggest part it that we can consistently keep Birdie from getting mentally aroused or “worked up”, helping her control her reactive impulses. This is a game changer, we now walk her in our neighborhood, have friends over, we have even had dogs at the house with zero issues because of the guidance and boundaries we learned from training. Giving your dog up for weeks, worrying if you are doing the right thing both before and after training, and going into situations, with your dog, that would have sent you down an anxiety bender in the past is hard. It was difficult for us, we struggled with it for more than a little while and we had Kristen’s support through it all. We continue to have that support when needed by email or phone and also with social meet ups to keep Birdie’s skills up to par. Her social media stories and videos are full of reminders and tips and tricks, and we still watch them daily for their content. I cannot recommend Find Your Balance Dog Training more, Kristen changed our dog owner lives and saved our relationship with Birdie. Darwin came in to our lives when he was about a year old. Our sweet, smart, and humorous new family member came with some pretty significant anxiety issues. Darwin was a guy that was always worried about everyone and everything going on around him. This worry could at times erupt in to reactivity, particularly when it came to strange dogs. We worked tirelessly with Darwin’s training. His intelligence made obedience training a breeze but we would still find ourselves in situations where all of this training would be out the window once for his fight or flight response to dogs or people that he felt threatened by kicked in. That's when we found Kristen. She helped us to find a meaningful and effective l way to communicate with a dog that before this had seemed impossible to reach once he had escalated. Most importantly, we learned about the benefits of teaching your dog to be calm vs. simply teaching an obedience command. This was a game changer for Darwin! We've been equipped with the tools to guide our dog and to advocate for him in any situation. In return, Darwin no longer feels he has to worry and therefore no longer needs to behave in a reactive or fearful manner. Our goal was to have a dog that we could take anywhere, who could participate fully in our lives, and who we could enjoy all of our activities with. Thanks to Kristen's hard work and continued support (for Darwin and for us! ), we now have that dog. My experience with Kristen and Find Your Balance Dog Training was and continues to be exceptional. I have trained numerous dogs personally, but they were uncomplicated, easy dogs. My current dog presented numerous challenges (dog reactivity and overall challenging of my authority). Kristen quickly diagnosed the problem with both my dog and my approach and set us both on a new course of action. As a result I now have a dog that listens to my commands, walks beautifully on and off leash, has an excellent recall, and is comfortable in stressful situations as she knows to turn to me for direction rather than taking control of the situation herself. I feel so calm and confident with my girl and she with me. It's a whole new relationship. Kristen's training approach and her personal interest has made an incredible difference in our lives. I can't thank her enough. We are very lucky to have a trainer of her caliber here on the East Coast. Extremely happy with the work that Kristen has put into our German Shepard Kota. Kota is a girl who is afraid of life in general and her anxiety was causing her to be a less than desirable pet. With the training provided to Kota with the 3 week board and train program, Kota has become a total pleasure to have in the house. We now have the solid foundation to work with and know that if we run into any snags along the way Kristen is there for us. Can't thank or recommend her enough! Our dogs name is Wallace, he is a 135-pound Italian Mastiff. He is a big guy, who had some common behavior issues; add such a big dog to the equation and these common issues could become very dangerous. Before we met Kristen, Wallace’s behavioral issues were things like pulling on the leash, guarding his humans, leash reactivity towards other dogs, among many other bad habits. We are so lucky to have found Kristen when we did! Wallace is a very strong, stubborn guy, and we basically ran into a wall with him. Every walk was nerve wrecking and strenuous to say the least. We weren't sure how to properly correct the bad behaviors what so ever, so they continued to get worse. We did understand that walking around with such a strong breed and not being in complete control is very scary, and very dangerous for everyone involved including the dog. We luckily stumbled upon Kristen’s board and train program while doing some research on different methods of training and trying to figure out what our next move with the big guy was going to be. We decided it was time that we got some help before we got the dog in trouble, or got someone else or ourselves injured. We consulted with Kristen, and we agreed to put Wallace in the 3-week board and train program. We do not regret it one bit, it has changed our lives, Wallace included. Prior to dropping Wallace off, we were very nervous about how he would take to the training, we were even worried that Kristen might have to send him home because he was “untrainable" but we were very wrong, and our worries didn’t last long. Wallace was dropped off with his muzzle on for safety reasons, and it was a good thing because he was very reactive and aggressive towards Kristen at first. But within the first two days, Kristen was walking Wallace, and he was hanging out around the house... without his muzzle on! During the duration of the board and train program Kristen provided us with some readings and homework of our own, and also kept us updated on Wallace’s progress through social media. These updates and the homework allowed us to learn the training methods at the same time as Wallace. When it was time for Wallace to go home and put the training to use, his behavior was like night and day! No more pulling at all, perfect behavior on walks, no more reactivity when people or dogs are around, perfect recall off leash, no more going crazy on our vacuum cleaner, the list goes on. Wallace is still the same awesome dog that he was before training, only now he is way calmer, and most importantly controlled! Kristen equipped us with the tools and the knowhow to correctly communicate with Wallace and show him right from wrong, now any unwanted behaviors that do arise we are ready to deal with them head on and Wallace is no longer confused about what is expected of him!! The training was well worth it and has made all of our lives 10 times easier, and a lot less stressful. We recommend “Find Your Balance” to all of our friends, and we wouldn’t think twice about sending our future dogs to get the same training. Kristen has gone above and beyond for us and Wallace! Wallace is a frequent visitor now, whenever we need a break, go on vacation, or Wallace needs a touch up on his training; we can bring him back for structured boarding!! Before we knew about Kristen and the structured boarding service she offers, we didn’t think we would ever be able to go on vacation again!!! Now we know we have a safe place to bring our big guy whenever the need arises, and the weight off of our shoulders from that alone is tremendous. I have a bernese mountain and St Bernard mix and I would take her to the nursing home to see my wife and son . she would jump up on the people's wheel chairs and pull me from place to place . so I lfound a trainer and called him but he was full and gave me find your balance dog training . I looked them up and seen what she did and read the reviews . so I emailed Kristen and we talked about what I was looking to have her help lady be a good and behaved dog. so on August 5th lady started her training . it was hard to let her go . Kristen kept me informed on how lady was doing on instagram and you tube and also with homework for me to do . after the three weeks Kristen and I did 2 hours of training me on my dogs new way . Lady and I worked together for a week after she came home and Kristen came to my home to see how we were doing . well I was so amazed with the new lady who would listen to me no more pulling me and walk by my side . the first time we went to the nursing home she listened to me and no more jumping on wheel chairs . Lady was a very good lady and now sits so the residents can give her a nice pat . it was the best decision I made to go with find your balance dog training . I know have a great dog who know looks to me for guidance . Kristen I thank you for giving me a dog that is my buddy in our life together . Kristen you are a person that loves what you do too help having a dog that is happy . P.S. if you get too close to lady she will still give you that big lick lol. Find your balance was recommended to us by a friend once we had realized our dog had gone beyond the point of no return with bad habits and behaviours. We have a two year old son and my dog Huey, had become so terrifying for my child because he was constantly stealing food from his hands and ripping toys away to gain attention. I believed there was no hope for us. The dog was causing so much friction at home and it got to the point where he was so anxious he couldn’t even get in the car without losing his mind. My friend had gone to Kristen to help train his dog and get them back on the straight and narrow. He described their success story and spoke so highly of Kristen and her skills. As soon as I was in contact with her I knew that I had made the right decision. It was hard saying goodbye to Huey at first but within the first 24 hours just to see the positive ground work she had done with him and how well he was adapting to the structured way of life was absolutely astonishing. Huey was there for 4 weeks. He is an extremely anxious dog and had a lot of work to do. So many corrections in his behaviours and just basic respect between my dog and our family memebers needed to be reestablished. Kristen was patient yet firm and stuck with Huey until the end. I can honestly say that my Hue is a changed dog. We still have to stick to the rules at home but we are doing better than ever. I highly recommend Find Your Balance and Kristen's expertise when it comes to dogs. She is very experienced with them and she is also so well educated on the proper practices when dealing with all different behaviours and mannerisms. She even did a house call follow up after our two go home sessions which was so much appreciated. I look forward to sending Huey back for a visit on the future. In May of 2018, my partner and I adopted a rescue dog from a shelter and as is often the case, Murphy came with a few issues that were beyond my previous dog experience. He was dog reactive and prey driven and at 80 lbs, I knew that we couldn’t do this alone. I had heard through the canine grapevine that Kristen from Find Your Balance Dog Training did great work with dogs and after a phone conversation, I felt that I was making the right choice. Kristen recommended that Murphy stay with her for a 3 week board and train. During the time that Murphy was at Kristen’s, she regularly posted videos of the training that she did with Murphy and his accomplishments. She even sent us emails with updates so that we could be part of his training process. She truly wants the best outcome for each dog and their family. And like any good teacher, she gave us homework, which made us more prepared for when we brought home our improved version of Murphy. We continue to build off of the foundation that Kristen built with Murphy, training him with the tools and resources that she provided. We are so grateful for her kindness, understanding and her ability to take even the most difficult dog and help them to be calm, balanced and the best dog that they can be. We found Kristen at just the right moment, as we had been considering finding Ella a new home. We felt we were not equipped to manage a dog with separation anxiety, the need to constantly be with people and the bad choices she was making; little Ella was taking over our life. Kristen was not only reassuring but very patient with our questions and incorporated my 12-year-old son into all of the discussions. We started with a 2-week board & train and extended for an additional week. While my son had tears when we left Ella, we knew that we were leaving her in very capable hands. The regular updates by email, Facebook and Instagram, along with our homework, made us feel part of the process. Wow, what a difference. Ella is calm! Walks are so easy and she is often complemented on her behaviour. Our visitors remark on the difference when Ella stays in place. And we can have Ella outside with us, using our follow and down commands. Ella is now a part of our life, not overtaking it. I can’t thank Kristen enough for the work she has done with Ella and with us. And her support did not stop at the end of the board & train; training the humans has taken a little more work! Kristen has answered every emailed question, she has done an at-home visit and boarded Ella at short notice when needed. Kristen has made a huge difference in all our lives! Thank you Kristen, and we look forward to continuing to work with you. Find Your Balance Training was special treat for me because I have a 90 lb German Shepard who likes to jump and chase cars and after the 2 week course with Kristen he behaves like a completely different dog he listens to commands and is much calmer. I spend a lot of time with him going over what she taught him so that he remembers it. I am pleased with the results of the 2 week training. We adopted our sweet shy little Beamer from the SPCA three years ago in 2015. Over the course of the past three years, Beamer slowly but surely showed us more and more of his personality, some good and some bad. Before Kristen (or what we refer to as BK), Beamer struggled with separation anxiety which led to accidents in the house on a daily basis, on-leash re-activity, territorial tendencies and a stubborn beagle attitude. We knew that with some guidance and boundaries, most (if not all) of these problems would go away and were totally fixable. However, we also knew we did not know what we were doing or how to fix those problems. With Kristen's guidance and a stellar three-week board and train we are now accident, attitude, and re-activity free! Beamer is a much more polite and well-mannered sweet-boy and we are much better advocates for him, which in turn allows him to trust us a lot more. It has made a world of difference to understand what made him tick, react, and make the choices he did. Now, we have the tools to set him up for success on a daily basis, and we have gotten our lives back. We had no idea how much work we were all doing by not addressing his issues. Now, our days are always full of polite, easy and peaceful behaviour. Kristen, you have truly changed all of our lives! Elliot is a fun loving, and tremendously energetic Miniature Schnauzer, with a personality that is significantly larger than his stature! Similar to the energizer bunny, he never stopped going and going and going. He always needed to say “hi” to every dog he saw which wasn’t an issue, until it turned into loud obnoxious barking, and soon after, lunging! He never meant any harm, but it was clear that other dogs and their handlers became hesitant to walk past Elliot and I. Along with the overly aggressive “hellos,” he never wanted to sit still, play time was ALL the time. Eventually walking became unpleasant for both of us. Trying to explain to every passerby that he wasn’t aggressive and wouldn’t bite became an embarrassing task and eventually walks became few and far between. It looked painful watching him bark and tug on his harness, and it was certainly humiliating to me. He became fixated and in a trance that was impossible for me to break until the other dog was completely out of sight. I tried everything: different types of collars, harnesses, treats, only walking at certain times, watching YouTube videos, and we went to 7 different trainers (both group and individual sessions). Absolutely nothing changed with him and after working with other trainers, he and I were sent home with no follow ups or assistance after the training was over. Feeling deflated, I was pointed in Kristen’s direction in the spring of 2017, and she was great! She was extremely personable, she answered all of my questions clearly, and provided a lot of reassurance and understanding of my situation. The information she provided me about the E-Collar allowed me to make a sound decision without any pressure. At the time, Elliot was only 1-year-old, so I wanted to see if perhaps his bad manners would improve with time, sadly, they did not, it only got worse! So, I reached out to Kristen again in October of 2017 and was met with the same positive and reassuring approach that I was met with in the spring. A couple weeks later, and he was off to Board and Train! Over the course of his 4-week Board and Train, Kristen sent email updates, and her videos on her Facebook site allowed me to see Elliot’s progress as if I was right there. I had a number of visits to learn how to use the E-collar and how to provide Elliot with constant direction. I watched him learn how to obey commands, how to sit and wait patiently, how to share space with other pets and not feel the need to go ‘play fight’ with them, and the biggest change of all: how to walk passed other dogs without needing to bark or lunge! Since coming home, Elliot still remains his fun loving and energetic self, but he can now self-regulate and have a much calmer state-of-mind. He has even gone to work with me and stayed in a ‘place’ command while I worked at my desk. I feel like he can now go anywhere with me now! As for myself, I have become a significantly more confident handler and am able to provide him with direction to help him every step of the way! Kristen has continued to check in on us, and has made it clear that if ever we need guidance (which we certainly will!) to reach out. To me, this is the biggest difference between her and the other trainers we’ve been to. I truly feel like Kristen is passionate about her job and cares about the continued success of everyone she works with. Elliot and I are forever thankful for her taking us on as clients, and I would recommend Kristen at Find Your Balance Dog Training to anyone who felt as lost as I did. Our dog Henry is a sweet little Terrier mix with a loving and playful personality. Unfortunately, he is plagued with severe anxiety and fear aggression. We as owners did not know how to fix this issue, and after many failed training attempts, we knew that we had to do something, not only for our changing lives (marriage, starting a family), but for Henry’s quality of life. It was just not fair to let him live in fear and upset without any direction. That’s when we contacted Kristen. We had done a lot of research on different training methods, and e-collar definitely seemed like the safest route and most successful for dogs like Henry when done correctly. We spoke with Kristen and then took the plunge: a four-week board and train. Giving up our baby to another person for four straight weeks was a very hard pill to swallow. But after speaking with Kristen and after meeting her, we felt more at ease. We were confident that this was going to have a huge impact on Henry’s life. Kristen makes you feel like you’re there with all of her updates, including videos and email updates. After two weeks, we were able to go and visit with Henry and do some on site training with him. We continued these visits 1-2 times a week until he came home. We could see each time the difference in Henry. He was still his sweet little self, but he was so much more relaxed! He was able to step back and let us take the reins of situations. Walking was no longer a painful chore, but is now a fun relaxing interaction for all of us. Henry still has lots of learning to do. We all do. But thanks to Kristen, Henry is so much calmer and patient to allow us as owners to help him figure things out as they come. Kristen, we cannot thank you enough for all that you have done for our family. We are so much more at ease, and we know that Henry is a much happier boy now that he can enjoy life without all of the stress on his little shoulders. We can’t wait to continue training with you in 2018 and beyond! We recently had our 9-month old boxer mix enrolled in Find Your Balance Dog Training’s board and train program. Jolene spent 2 weeks with Kristen and we couldn’t be happier. Our rambunctious teenager came home to us so well behaved her new nickname is Miss Manners! We now have the confidence to take her places and know she will behave calmly, including in our home where she was prone to a daily bout of the zoomies. I’m happy to report there hasn’t been one episode of the zoomies in the 3 weeks she has been home. Additionally, it was very important to us to have reliable recall, so we could enjoy playing off leash without the stress of her running off into traffic etc. Now we are comfortable she will stay put or come to us when called and she calmly handles the distractions of other dogs and people sharing the space, and we get to really enjoy our play time together, stress-free! We just got a new puppy, Charlie and after a few weeks we knew we needed some help to get him on the right track. We have two young children and Charlie was jumping up all the time to nip them. He was wild on the leash running in circles. We reached out to Kristen and she was amazing! She was so patient and Charlie responded right away. We saw a big difference after our first session. He was eager to please and show off his new skills. Now that he's finished his puppy training he's like a new dog. He will walk perfectly beside us with his prong collar on for long walks. It is life changing to have a well behaved dog. Thanks Kristen! I love my boy Snupe, have from day one. As my first dog ever, I knew very little about training but with a two and a half week board and train our relationship is stronger and more relaxed which means better for us both! Snupe was reactive to, well, everything and now he walks by bikes and kids and other dogs without so much as batting an eye. He heels while walking, no pulling at all. He comes on recall, he stays in place while we eat, are on the phone and have visitors. I can't say enough about how amazing Kristen and Find Your Balance Dog Training are. She has changed my life for the better with my sweet Snupers. Desperate and frustrated. This was my situation when I first contacted Kristen. It was a phone call with her that made my day and changed the oncoming days. My name is Shpresa and my husband name is Carroll. We are parents of two fury babies: Pepper and Chili. Both Heeler dogs. Maybe not to much known as a breed in Nova Scotia. Chili is a Red Heeler and Pepper is a Blue Heeler. Chili is one and a half year old and Pepper is 6. Chili is a pure breed and we picked him up in Maine, while Pepper is a rescue. We love our dogs more than anything in the world and we do our best the give them a beautiful life with us. But love doesn't help in some situations. Chili had been in basic training classes when he was still a pup of 3 months old, but that was not enough. Growing up, he started to have some minor issues which we ignored and we didn't give the necessary attention. These issues lead into real behavioral problems and made our life frustrating. I contacted Kristen after several serious events; Chili was lounging and barking at everything that moved (people, joggers, bikers, kids) and we had several complaints from neighbors to our landlord that they were afraid to pass by on the street because of my lovely boy Chili. I have to mentioned that Chili didn't bite, never ever. But people were upset because of his loud barking and the way that he wanted to approach the above mentioned things. So here I am, frustrated with Chili's behavior and afraid that our landlord will kick us out of the house... very desperate! And I said: "this is enough". I contacted a few trainers before Kristen but I didn't trust them. When I first talk to Kristen, something happened. It was like magic. Her voice made me trust her. I explained my situation to her and we agreed to meet. I trusted my gut; she was the perfect trainer for my lovely boy Chili. And here our journey starts. We met and we agreed to bring Chili to the One-on-Ones Training Program. I also have to mentioned that my boy has never been in day care nor had somebody else take care him. Chili wasn't even used to going to any of our family member's homes. He has only entered our house through the front door and wouldn't walk through our back door and he never went into our basement. So here we have my Chili that has some major issues and is also afraid to pass through the back door and afraid to go to our basement. Kristen was the first person I trusted with my dog. We left him with her for the first two days and he was totally different when we got him back. He would walk through any door and that night he followed me into the basement. And after those two days we had 5 more sessions and Kristen came to our house to help us with Chili. It would be a long story to explain what we did and what she said, but I want to say that Kristen not only trained Chili but she trained me as well. As I said, I love my babies very much. But love makes us blind and ignorant some times. And that is not enough to communicate with our dogs. I was totally against prong collar and e-collar at first because I thought these were two ancient torture tools that can only hurt dogs. I WAS TOTALLY WRONG! And believe me, if i say so it is true. Kristen introduced me to a totally different world. Kristen enlightened me about the modern use of these tools and the dogs' world. I was a dog owner for 4 years (as we got Pepper when she was two) and I thought I knew everything about dogs. We thought that letting the dog pull to say 'hi' to another dog in an exiting mode was normal, and that barking at anything that moves was normal, and sniffing without our permission was normal. So everything that our dogs wanted to do, we thought that was normal. Why? Because we love our dogs. But that isn't a good reason to let them do whatever they want. No! Definitely no! I met a guy two days ago, while I was walking Chili and he had two dogs; a schnauzer on leash and a little Shih tzu/ Maltese off leash. The little one came closer to Chili barking and the man said to me: "Please don't worry, he will not hurt you." And I said "I am not worried about him hurting my dog. But my dog is in training and I don't want to cause any problems ." So would it be good enough that my dog was good today and didn't involve himself in a fight but he didn't listen to me and he didn't stay beside me? NO! I must always advocate for Chili and tell him what to do. And I say this because Kristen told me totally different things. She told me that you are the leader and your dog has to be beside you and focus on you no matter what happens around you. She assured me that my dog was not an aggressive dog but an insecure dog. She told me that Chili is a hell of a smart boy and a challenging one and I have to work hard on him. She told me that I have two trust my gut in training. She told me that training is not a month or two, it is lifestyle and a lifetime commitment. She told me that feeling bad or sorry for your dog about unpleasant situations that have happened to them in the past will not help them, but moving on and giving him the right new direction is the only path to success. She told me a lot of things about the dog's world. But I don't want tell you all this, unless you want to find out by yourself so to cut the story short, Chili's world has changed 100 percent. He finished his training last Tuesday, but this doesn't mean that he will not be trained anymore. Kristen's job is finished. But mine is still on: consistency and confidence. These are two thing that Kristen told me. Am I happy with her? YES! Kristen is an angel. And I believe in ANGELS! Thank you very much Kristen for everything! "We are so thankful for Kristen. Her puppy training class set the foundation and gave us the confidence and know-how to continue working with our Jolene. She taught us how important it is to be consistent (and how small an inconsistency can actually be), how to recognize how far we can go, and when we might be getting faked out! As a result, we have a well-behaved puppy who can enjoy more freedom and join us when we go more places, because we know she’ll be welcome. Our daily walks are now a joy vs stressing over what will happen when we meet this or that, and I have confidence that when she is older she won’t be dragging us around. When we eat dinner, she stays put on her pillow, with the Place command. We are looking forward to the e-collar/off lead training with Kristen when Jolene is older. Thanks Kristen!" 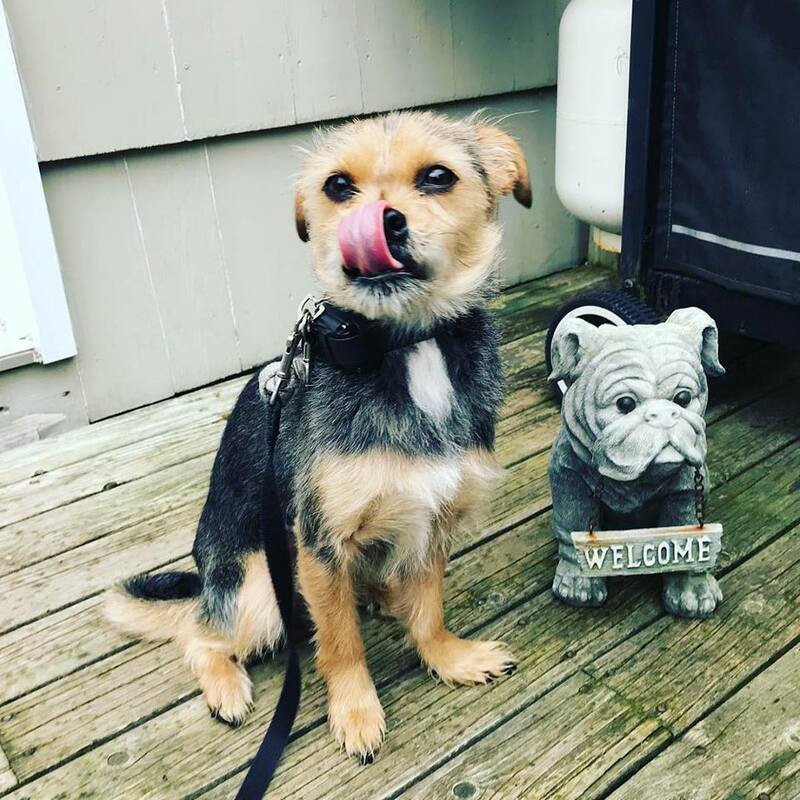 "We recently adopted a second dog and quickly realized he was going to be more than we bargained for. We were able after a lot of frustration to handle some of it ourselves but he still had a lot of bad habits and we needed help. His leash and recall issues weren't getting any better and his reactivity towards other dogs was getting worse. After a lot of searching we found Kristen. After the first two weeks with Kristen we noticed an improvement in him. He was finally making the progress he needed to. 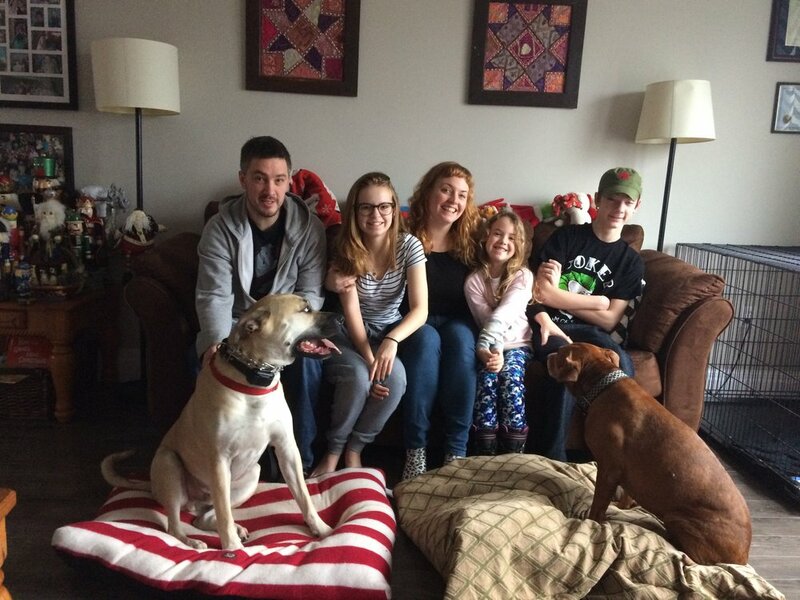 Upon coming home after a month in Kristen's care he came home a new dog. He had found the confidence he desperately needed. His personality was the same but he had manners, walked like a pro on leash, and his reactivity was under control. We did the homework Kristen gave us and we now have a dog that is more calm, relaxed and well mannered than we ever thought we could have. We can't say enough about the work Kristen did with our boy. We definitely made the right choice." Our "boys" Teddy (a 3 year old husky mix) and Mason (2.5 year old boxer) went through Kristen's Walk Doctor program and One-on-One Training respectively. Kristen showed us how to tune into their needs and use the proper tools in a positive way and we saw changes almost immediately! Watching her introduce a prong collar (on Teddy) and e-collar (on Mason) was incredibly comforting. Our time with Kristen has given us confidence, calmness, and consistency in our home ♥️ She has a wealth of knowledge and an infectious positive attitude that I truly believe enables her to train any and all dogs. We cannot thank Kristen or recommend her highly enough!! Without you I would not have been able to walk both big dogs at 9 months pregnant, let alone have the confidence and pure joy of bringing home our baby girl Paige from the hospital to meet her well behaved fur-brothers!" "Reaching out to Kristen for help with our pup Levi was seriously one of the best decisions we've ever made as dog owners! We were really struggling with leash pulling, and poor recall. It was impossible to walk Levi without him dragging us down the road and off leash hikes weren't even an option without him running off on us! Now that we've worked with Kristen we're so thrilled with how amazing Levi is doing and our lives have changed so much for the better! Kristen helped us to reach all of our goals and she was so awesome and easy to work with! Walking Levi is no longer a task and is actually enjoyable, and being able to trust our dog off leash is such a great feeling! Levi is now loving every minute of his off leash hikes!! Thanks so much again Kristen!" "Kristen is one of the most inspiring women I've ever met ! She's the kind of person you didn't even meet and you feel like you can trust her 100%. She's so dedicated to her dogs and dog's customer, it's like she's on a mission to save them all ! I've been training dogs for the past 4 years without any training tools such as prong collar and e-collar because they were scaring me. And then, I've start looking at Kristen's videos and I thought, wow this woman is the sweetest how can she use these tools if she ever felt like she's scaring these dogs. And that's when I understood that I was wrong about them, the tools actually help dogs to be confident ! As sweet as she is she instantly said Yes !!!! She came to Quebec for a entire day teach us how to properly use the prong and the e-collar on a few dogs, always making sure that we understood everything, we follow every steps and that we're not going faster than our dogs. We spent a wonderful day, learning a lot of things ! And after everything that she has done she even keeps helping us when we have some questions! If you are already working with dogs and you want to help even more, this workshop is totally for you!!" 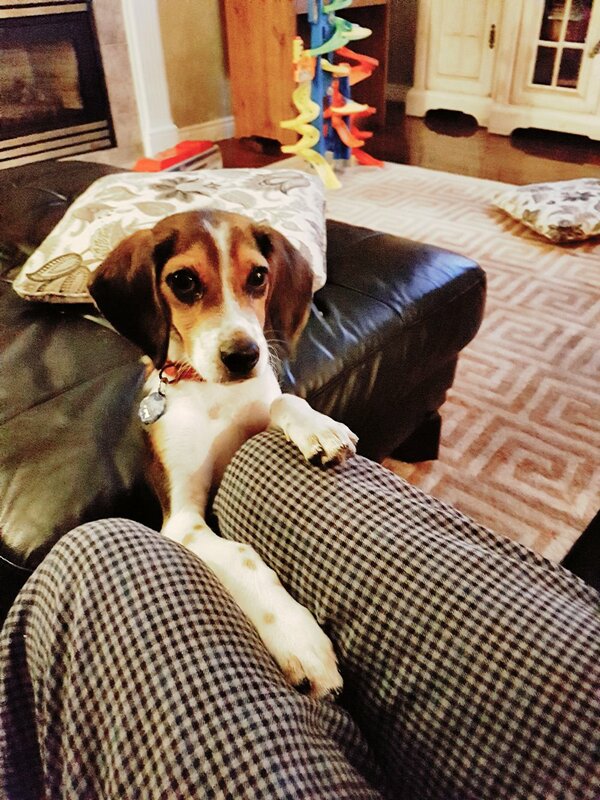 "Murphy's behaviour has been great since we started training with Kristen! She quickly learned a lot of the basic commands (sit, down, come, etc.) Kristen taught us everything step by step and at a pace that worked for Murphy. The private training was a great choice. It gave us time to ask any questions that we had and Kristen was really able to focus on certain training aspects and areas where Murphy needed a bit more help. The private classes really allowed us to move at a good pace and get a lot of great training in! In addition, she was always available via. phone or e-mail to answer any questions and if our puppy wasn't understanding or catching on she always took the extra time to focus in on that particular area. We feel very confident in continuing! After each training session Kristen would follow up with a step by step e-mail outlining everything we had gone over in the last session. Repetition has been key. Murphy is only 3 months old and already knows several commands that we would not have been able to accomplish so quickly without Kristen's help!" "We are so thankful to Kristen for her dedication to Boss's training and transition into our home. Even as lifelong dog owners, we learned a lot over the last 6-weeks about managing behaviours and building strong stepping stones for Bo's success as a model 4-legged citizen. Thank you Kristen!" "As first time dog owners, working with Kristen was the best decision we made for ourselves and new puppy, Kali. Before Kristen, we were watching YouTube videos on how to train our dog and had mild success. Once Kristen started coming to our home, our progress skyrocketed! Having her teach us, watch us and give us feedback on how to train our dog has been so valuable. We now have the knowledge and confidence to use these methods and continue training Kali on our own. Not to mention, Kristen is so organized (provides handouts and follow up emails) and has always answered any questions quickly by email. Her support is outstanding. Thank you so much Kristen for helping us establish a great base for Kali!" "After a very traumatic experience with the young and inexperienced local service dog group, I am an owner training my 1 year old Australian Shepherd. I find many of the things that you work on very beneficial to what we are doing. Even though I am doing obedience lessons with a local trainer it is so nice to get these private little lessons via your videos. I just want you to know how much I appreciate it. You do make a difference in our lives. It is such a pleasure to watch the progress of these dogs. I'm sure you have amazing patience and understanding. Please keep up these great videos :-)"